AFC Rushden & Diamonds made a welcome return to winning ways in challenging conditions at Hayden Road. The remit was to get back to winning ways so this was very much a case of ‘job done’. Diamonds went into this clash on the back of a run of three matches without a win. 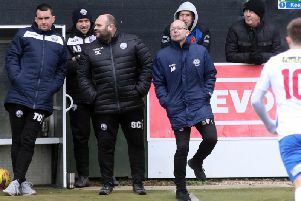 With the margin for error in the race for the play-offs getting smaller by the week, Andy Peaks’ men really had to get back to winning ways. It wasn’t easy in tough conditions and against a tough Needham Market side. But Diamonds found a way to get the job done. And, at this stage of the season, that’s what you have to do. A gale-force wind usually ensures entertaining football is at a premium. This, of course, wasn’t an exclusive problem at Hayden Road as the stormy conditions affected matches up and down the country on Saturday. But when it comes to the weather, this was probably as bad as it can be for football. I am sure most players would tell you that playing in driving rain or freezing conditions would never be a problem. But it’s almost impossible to expect a high standard when a 40mph or 50mph wind is sweeping across the ground. To their credit, both teams contributed to a watchable first half. But the conditions deteriorated further after the break and it resulted in 45 minutes of action that really won’t live long in the memory, not that any Diamonds fan was complaining as their team saw things out to seal three crucial points. If Diamonds do finish in the top five, their fine form at Hayden Road will have played a big part. I am sure I have touched on this subject before but it’s definitely worth mentioning again. Diamonds’ form at Hayden Road this season has been highly impressive and has played a key part in helping them to challenge for a play-off place. With just six weeks left of the season, Rushall Olympic remain the only away team to have left Hayden Road victorious. Andy Peaks’ players just look comfortable in their own surroundings. They know their own pitch and they receive good backing from their supporters. Three of their last seven league games will be on home soil with two of those being against the current top two. It will be interesting to see if they can maintain their impressive form on their own ground right up until the end of the campaign. Sam Johnson is a perfect example of how a run of games can bring the best out of a player. 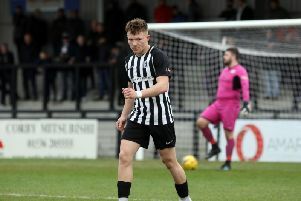 It’s fair to say little was known of the winger around these parts until he signed for Diamonds in November having had a short spell at Kempston Rovers following his return from playing and coaching in New Zealand. Johnson had to wait for his chance to get into the starting line-up but he is beginning to make the position on the right-hand side his own. It has taken him time to get right up to speed but Andy Peaks has shown his faith in him, he has kept him in the team and it’s proof that having a run of games can bring the best out of players. He has chipped in with some key goals in the last few weeks and he was a standout performer in this game. He has pace to burn and an excellent work ethic, something the Diamonds manager is extremely high on. Johnson now looks settled and you get the feeling there will be even more to come. It’s a seven-game season and Diamonds probably need six wins to seal an extended season.